Nature must be respected, and never are we more aware of that than during natural event emergency situations. But it’s important to remember that nature also can be a beautifully healing and energizing force. I remember stepping out onto our wooden deck on a beautiful Saturday morning. I took one deep breath and nature did its wonder-working magic on me. The energizing warmth of the morning sun transformed me. I literally felt lighter as the stresses of the week seemed to drop like scales from my body. So much can happen in nature, even when it seems calm, like nothing is happening. In that moment, a cleansing, healing, bioenergetics force was renewing me from the outside-in. I was experiencing what naturopaths call the “life force,” or what acupuncturists call chi. In Japan, this communing with nature is an ingrained part of the culture. But in recent decades, it has gone from being a leisurely pastime to an official component of medicine. In the 1980s, the Japanese forestry ministry began promoting the practice of shinrin-yoku (literally “forest bathing”) as a healing therapy. The idea is that being in the forest – not hiking, not counting steps or pursuing any specific goal, but just being – has a profound effect on the body. And in the decades since, study after study has backed up that idea. Have you ever stepped out into nature and felt that “life force” awaken? The one I felt when I stepped outside on that beautiful day? If so, it won’t surprise you to learn that forest bathing can really turn your mood around. Japanese researchers have found that spending 30 minutes in a forest had major effects on people’s stress levels. After a forest bathing session, cortisol levels, pulse rate, and blood pressure all dropped. Other research shows that forest bathing can reduce hostility and depression while making people feel more lively. Nature’s effects on mood may seem logical. But it has a measurable effect on non-psychological health as well. One study that turned a lot of heads (toward the trees!) looked at the numbers of natural killer (NK) cells before and after forest bathing. NK cells are an integral part of the immune system. They jump into action to help the body combat infections and even cancer. 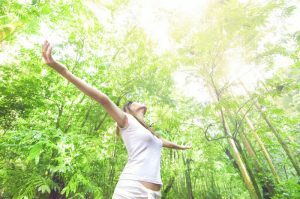 This study found that not only did NK cells surge after a forest bathing session, but they remained elevated for a month afterward. A recent study examined the effects of forest bathing on people with chronic obstructive pulmonary disease (COPD). It found that after just three hours of being in the woods, people had a variety of immunologic, inflammatory, and neuroendocrine changes that spoke to COPD improvements. The research is preliminary, but if it pans out it could be an exciting development for people with COPD. Forest bathing is simple. Just get out into the woods and relax. You don’t need a destination or a purpose. Don’t worry about burning calories. Just be. If you don’t live near a forest, no problem. You can experience similar health effects just by going to a local green space. Find a park, and spend some time there, totally disconnected from screens, stressors, and the bustle of daily life. When we go into nature, we invite her to strengthen us, making us more resistant to disease and depression. This life force is powerful enough to enhance positive, life-giving tendencies. Embracing nature brings a perpetual revitalization, an enduring regeneration. This is the renewing potential of nature, and the reason it is one of the Eight Essentials included in The Healing Revolution.